This domain is found on CASC3 (cancer susceptibility candidate gene 3 protein) which is also known as Barentsz (Btz). 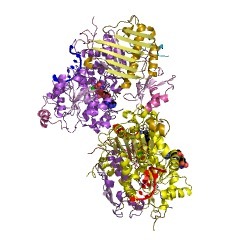 CASC3 is a component of the EJC (exon junction complex) which is a complex that is involved in post-transcriptional regulation of mRNA in metazoa. 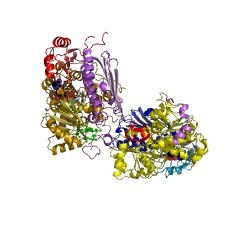 The complex is formed by the association of four proteins (eIF4AIII, Barentsz, Mago, and Y14), mRNA, and ATP. 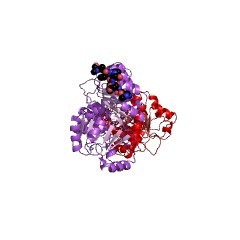 This domain wraps around eIF4AIII and stacks against the 5' nucleotide (PUBMED:16923391). There are 1119 Btz domains in 1117 proteins in SMART's nrdb database. Taxonomic distribution of proteins containing Btz domain. This tree includes only several representative species. The complete taxonomic breakdown of all proteins with Btz domain is also avaliable. Click on the protein counts, or double click on taxonomic names to display all proteins containing Btz domain in the selected taxonomic class. 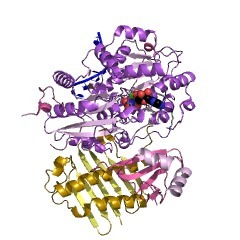 The crystal structure of the exon junction complex reveals how itmaintains a stable grip on mRNA. The exon junction complex (EJC) plays a major role in posttranscriptionalregulation of mRNA in metazoa. The EJC is deposited onto mRNA duringsplicing and is transported to the cytoplasm where it influencestranslation, surveillance, and localization of the spliced mRNA. 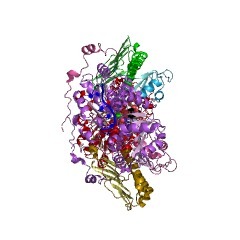 Thecomplex is formed by the association of four proteins (eIF4AIII, Barentsz[Btz], Mago, and Y14), mRNA, and ATP. The 2.2 A resolution structure ofthe EJC reveals how it stably locks onto mRNA. 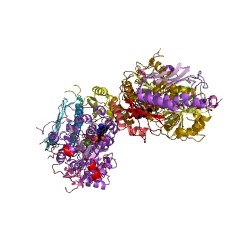 The DEAD-box proteineIF4AIII encloses an ATP molecule and provides the binding sites for sixribonucleotides. Btz wraps around eIF4AIII and stacks against the 5'nucleotide. An intertwined network of interactions anchors Mago-Y14 andBtz at the interface between the two domains of eIF4AIII, effectivelystabilizing the ATP bound state. Comparison with the structure of theeIF4AIII-Btz subcomplex that we have also determined reveals that largeconformational changes are required upon EJC assembly and disassembly. An eIF4AIII-containing complex required for mRNA localization andnonsense-mediated mRNA decay. The specification of both the germ line and abdomen in Drosophila dependson the localization of oskar messenger RNA to the posterior of the oocyte.This localization requires several trans-acting factors, includingBarentsz and the Mago-Y14 heterodimer, which assemble with oskar mRNA intoribonucleoprotein particles (RNPs) and localize with it at the posteriorpole. Although Barentsz localization in the germ line depends on Mago-Y14,no direct interaction between these proteins has been detected. Here, wedemonstrate that the translation initiation factor eIF4AIII interacts withBarentsz and is a component of the oskar messenger RNP localizationcomplex. Moreover, eIF4AIII interacts with Mago-Y14 and thus provides amolecular link between Barentsz and the heterodimer. The mammalian Mago(also known as Magoh)-Y14 heterodimer is a component of the exon junctioncomplex. The exon junction complex is deposited on spliced mRNAs andfunctions in nonsense-mediated mRNA decay (NMD), a surveillance mechanismthat degrades mRNAs with premature translation-termination codons. We showthat both Barentsz and eIF4AIII are essential for NMD in human cells.Thus, we have identified eIF4AIII and Barentsz as components of aconserved protein complex that is essential for mRNA localization in fliesand NMD in mammals.